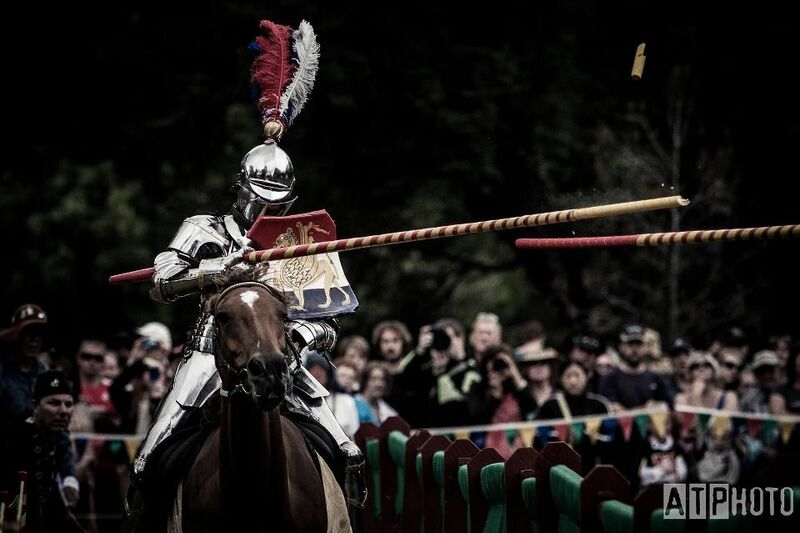 At the “Harcourt Park 2013 World Invitational Jousting Tournament” (in New Zealand), we tested new spiral cut pine tips in our lances instead of using the traditional length-wise cut balsa tips. Balsa is on a protected species list and is becoming more expensive. This adds significantly to the costs of jousting. Because of this we started looking for alternatives to balsa tips. When I was in Belgium at "Hackaland 2011", Fred Piraux showed me a video of a tip design made of European ‘yellow pine’ which a wood-turning friend of his had suggested to him. Fred tested several prototypes which broke well on a static quintain and very kindly gave me a fragment of one as a sample to take back home. It is essentially a solid dowel with a spiral cut down most of its length with a router bit. 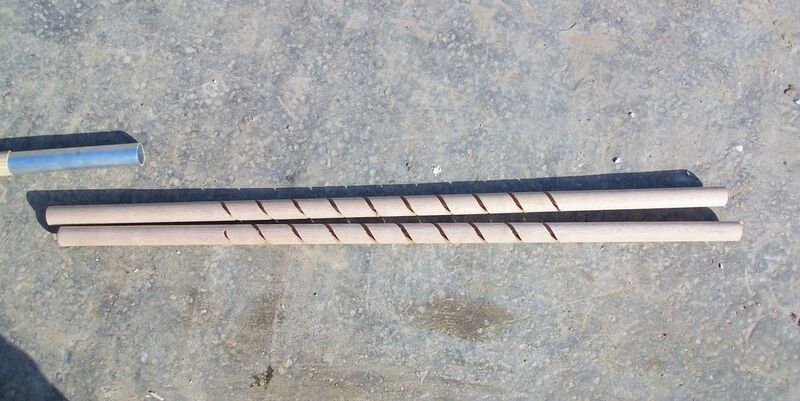 Dave Smith, our announcer at all of our jousting events in New Zealand, built a rig to allow mass production of these tips and made several prototypes for me from pinus radiata, which is a widely used forestry timber in New Zealand. It is cheap and is also a renewable timber. We tested two spiral cut tip designs late last year. One had a deeper cut and one a shallower cut. Both broke very well on tests against our ‘shock’ quintain, but when I had them tested with me as the target, people had trouble getting a good shattering effect with the shallower cut ones. So I commissioned Dave to make 200 of the deeper cut tips for our “Harcourt Park 2013 World Invitational Jousting Tournament” last February. Because the pine tip weighs 3 – 4 times as much as a balsa equivalent and because it is more rigid, you have to hit more accurately than balsa to get them to shatter correctly. By this I mean you have to hit square on. With balsa, because it flexes a bit more then pine, you can hit at a bit of an angle and still get a good shattering effect. With pine tips, the problem is that it is easier for the lance to deflect off the target at an unpredictable angle. By encouraging people to hit more accurately (i.e., square on), this risk is mitigated to some extent. 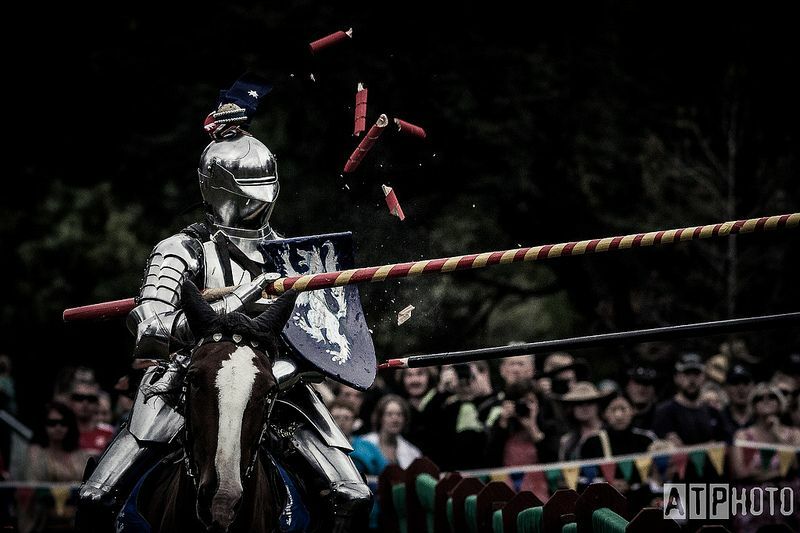 During the actual joust, when people hit hard and accurately, we had spectacular breaks that were louder than balsa. We also got multiple fragmentation, and the fragments flew further into the air (and into the crowd!) than balsa. In hindsight, the tips were cut too deeply, and although they hit harder than balsa, a few people thought they were a bit too easy. We also had a teething issue in that our timber supplier sent us dowels in 2 diameters – 30mm and 32mm – and the 30mm dowels were a little too easy to break. But when introducing something new into the joust, it pays to err on the side of caution. Regardless, everybody thought the new tips were a major step forward. We did test some prototype shallower cut tips at the tournament in front of the public as a demonstration. They broke very well, and the riders felt the impact a lot more. So the consensus is that we use these tips at future international events like "Harcourt Park", and we plan to use them at our next big international tournament which is planned for February 2014 at another location in New Zealand. Overall these tips were a great success as I wanted a tip that broke harder than balsa without the splintering that you get from balsa tips. Because people are cutting the balsa length-wise (although I have also recently seen this done with pine) the balsa tip splinters into sharp shards. However, with the spiral cut, the pine tips break blunt so there is no chance of a splinter entering an eye slit or finding a weak spot in armour. You can see the blunt ends left on both the broken piece and the remaining portion of the lance tip after the spiral cut pine tip broke off of Sarah Hay's lance during this rare tip to tip hit. 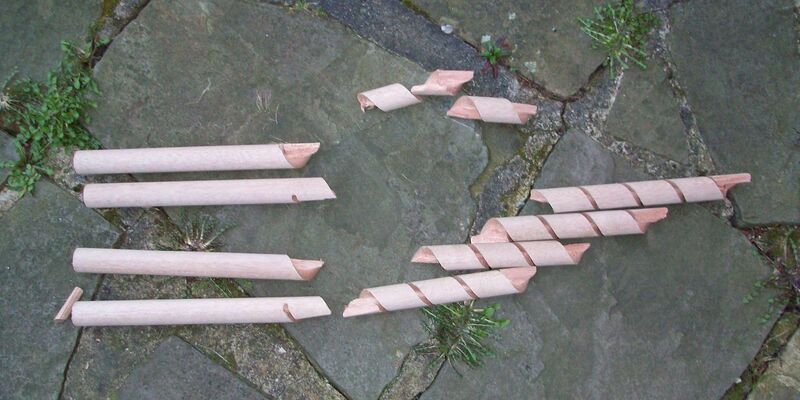 From the cost point-of-view, the spiral cut pine tips also worked out as being a bit cheaper than the last batch of balsa we brought. I would like to acknowledge Frederic Piraux from Belgium as the designer of these tips, and my manufacturer Dave Smith of Dannevirke, New Zealand for making our local prototypes and production tips.